Turkey is a major economy which straddles Europe and Asia. It is the world’s 20th largest emitter of greenhouse gases (GHGs). However, within the UN climate negotiations, it has an unusual position: it is a middle income country with low historic emissions, but it is also among the club of generally developed countries which form the OECD (Organisation for Economic Co-operation and Development). The Turkish economy and the nation’s demand for energy have been growing rapidly, trends that are set to continue. With its expanding energy needs mostly being met by fossil fuels – in particular, coal for generating electricity – Turkey’s emissions are set to rise significantly. However, it has promised some efforts to constrain its emissions growth. Graphic by Tom Prater for Carbon Brief. Turkey became a republic in 1923, following the defeat of the Ottoman Empire in the First World War. It elected secularist Mustafa Kemal Ataturk as its first president. Since then, it has become integrated in major international treaties, joining NATO in 1952 and being a founding member of the OECD in 1961. Recep Tayyip Erdoğan, founder of the conservative Justice and Development Party (AKP) and former mayor of Istanbul, became prime minister in 2003. In 2014, he wonTurkey’s first direct presidential election. The government’s strong response to the 2016 coup attempt led to a serious rift in Turkey’s relations with its western allies, including the EU, which has accused Erdoğan of using the coup attempt as a pretext to crack down on the opposition. Turkey has long harboured an ambition to join the EU, with membership talks launched in 2005. However, discussions have frequently been set back, often due to concerns over Turkey’s human rights record. Turkey’s economy has tripled in size over the past two decades, despite a setback due to an economic crisis in 2001. But unemployment in Turkey sits at around 10%, well above the OECD average of 5.5%. The government hopes to continue this economic expansion. Erdoğan’s political vision for 2023, the 100th anniversary of the foundation of the Turkish Republic, includes a target of becoming one of the world’s 10 largest economies, up from 17th today. The vision does not mention climate change. While previous Turkish administrations have also been lacklustre on climate ambition, the AKP’s focus over the past 15 years on energy expansion has meant Turkey has further accelerated its emissions. Erdoğan plans to continue increasing Turkey’s energy supply to support its growing economy. He also sees energy as an important component of its foreign policy. Turkey’s President Recep Tayyip Erdogan (centre) attends the UN Climate Change Conference (COP21), Le Bourget, France, 30/11/2015. Credit: Mikhail Metzel/TASS/Alamy Live News. The push by Turkey’s energy ministry to exploit domestic coal resources, as well as the close relationship between coal mine owners and the AKP, is at odds with any claims to be increasing action on climate change. Meanwhile, a governmental decree issued in 2016 provides exemptions from licences and permissions for fossil-fuel projects which have been defined as “strategic investments”. This could reportedly allow fast-tracking, or even elimination of environmental assessments in some cases. For years, Turkey has had an unusual status at the UN climate talks (see below). Within the negotiations, it has focussed largely on securing access to international climate finance. Polls show climate change is not a particularly big concern of those living in Turkey. However, this has not stopped Turkey from showing interest in hosting COP26, the UN climate conference scheduled for 2020. This will be a key year for the Paris Agreement’s ”ratchet mechanism” to push up climate ambition, as it is when the second round of country pledges are due. Turkey is one of only a few countries – and the largest emitter – which does not sit in any of the formal negotiating blocs at the international climate talks overseen by the United Nations Framework Convention on Climate Change (UNFCCC). Turkish emissions have risen faster than for any other Annex I (see below) country, more than doubling between 1990 and 2013. Turkey was responsible for emissions of 415m tonnes of CO2 equivalent (MtCO2e) in 2015, according to data compiled by the Potsdam Institute for Climate Impact Research (PIK). This is less than the UK’s emissions the same year, but larger than France’s. It is equal to 0.83% of global GHG emissions that year. This includes CO2 absorbed by land use, land use-change and forestry (LULUCF), which has been partially offsetting fossil fuel emissions in Turkey for decades. This is due, in part, to an increase in forest area, pushed by policies to expand Turkey’s largely state-owned forests. In its 2016 biennial report to the UNFCCC, Turkey said that the increasing trend of removals by LULUCF are driven by improvements in sustainable forest management, afforestations, forest-fire management and conversion of annual cropland to perennial cropland and grassland. Note, however, that there are high uncertainties in LULUCF emissions data for Turkey due to accounting methods. The sudden change in LULUCF emissions from a source to a sink in 1991 in the infographic above is due to a switch of data sources for land-use CO2. Forest in Ayvaz Denizli in Turkey, 2016. Credit: Murat Ceven/Alamy Stock Photo. Turkey joined the Kyoto Protocol in 2009, four years after it entered into force. 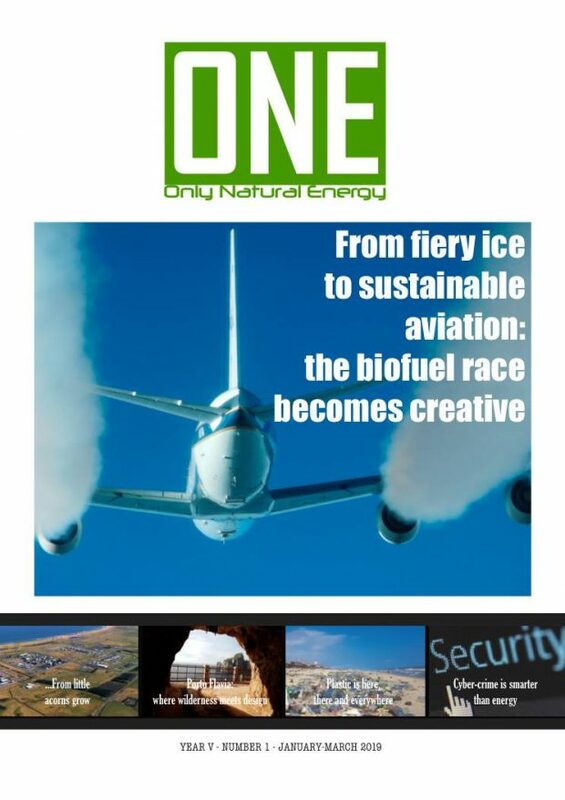 The protocol obliges developed countries, in particular, to reduce their emissions. However, Turkey remains the only party to it with no emissions reduction commitment. It has notpromised any action before 2020 at the UNFCCC. Turkey submitted a climate pledge (“nationally determined contribution”, or NDC) to the UNFCCC in 2015, in the lead up to the Paris Agreement being made. It has since signed the Paris deal, but has yet to formally ratify it, the only G20 country bar Russia not to have done so. Only 22 countries have not yet ratified the Paris deal, out of the 195 UNFCCC parties. Turkey expects its emissions to continue to rise steeply. Its NDC pledge to cut emissions by “up to 21%” by 2030, including LULUCF, compared to a business-as-usual(BAU) scenario. According to the NDC, in a BAU scenario Turkey’s emissions would nearly triple in the coming decades, from 430MtCO2e in 2012 up to 1,175MtCO2e in 2030. Its Paris climate target, therefore, means bringing emissions in 2030 down to 929MtCO2e. This would still be well over double 2012 levels and in excess of current emissions from Germany. Turkey does not outline any target year for peaking emissions or reducing emissions intensity, let alone reducing emissions in absolute terms. The target has been criticised for possibly not leading to any reduction at all, since the assumed BAU level of 5% annual growth may be unrealistically high, with actual growth closer to 3.5%. According to one commentator, there is also a lack of transparency over the methodology of the BAU and how the reduction levels were determined. Climate Action Tracker (CAT) rates Turkey’s Paris pledge as “critically insufficient”, meaning it is not at all consistent with the Paris Agreement’s goal to limit warming to “well below” 2C, let alone 1.5C. CAT’s rating means that if all government targets were akin to Turkey’s, warming would breach 4C. CAT also notes that the 2030 target in the NDC is equivalent to a 348% emissions increase from 1990 levels. However, assuming that Turkey’s population increases by the 10 million or so projected by the UN by 2030 – and that it sticks to its Paris pledge – per capita emissions will almost double to 10.5tCO2e by 2030. This would be well above today’s world average of 6.8tCO2e per capita. At the same time, EU per capita emissions are set to decline to around 6.4 tCO2e by 2030. Turkey has long sought a special status at the UNFCCC, in light of its particular national circumstances. Due to it being an OECD member in 1992, Turkey was listed among the “Annex I” and “Annex II” groups of countries at the UNFCCC. These countries, which are generally richer and more developed, are supposed to take the lead on tackling climate change, in contrast to the ”Non-Annex I” group of developing countries which have fewer obligations. Since it was also listed in “Annex II” Turkey was theoretically required to reduce its emissions and to assist “developing” countries which were in some cases richer than Turkey. After years of discussions, a decision taken by the UNFCCC in 2001 removed Turkey from Annex II and invited parties to “recognise the special circumstances of Turkey”, which make it different from other Annex I countries. In particular, this meant Turkey was not obliged to give climate finance. This paved the way for Turkey to join the UNFCCC in 2004. Turkey’s NDC also requests international financial support, which it says is key to reducing its emissions. It has also effectively made ratification of the Paris Agreement conditional on access to one source of finance, the Green Climate Fund (GCF). Erdoğan said last year that the US’s move to pull out the Paris Agreement makes Turkey less inclined to ratify the deal, since it jeopardises compensation promised to developing countries. Solar panels on rooftops, Alanya, Turkey, 2018. Credit: Alexander Klenov/Alamy Stock Photo. However, Turkey is already receiving significant international climate finance from several multilateral development banks and bilateral channels, as well as money for technology and capacity building from several finance institutions. One recent report found that Turkey is the single largest recipient of EU climate finance, receiving €667m per year on average between 2013 and 2016, far above any of the more vulnerable least developed countries (LDCs). Likewise, analysis by Carbon Brief published last year found Turkey was the fifth largest recipient of multilateral climate funds between 2013 and 2016, receiving $231m through channels such as the Clean Technology Fund (CTF) and the Global Environment Facility (GEF). Turkey has been assured its current climate support will continue. At the most recent annual climate talks, which was held in Bonn in November 2017, the Turkish delegation repeated that it would not ratify the Paris Agreement before a solution on access to the GCF was agreed. At the talks, discussions on Turkey’s access to the GCF again failed, reportedly due to the concerns of major negotiation blocs, including the G77/China, given that the GCF was intended to support developing countries. 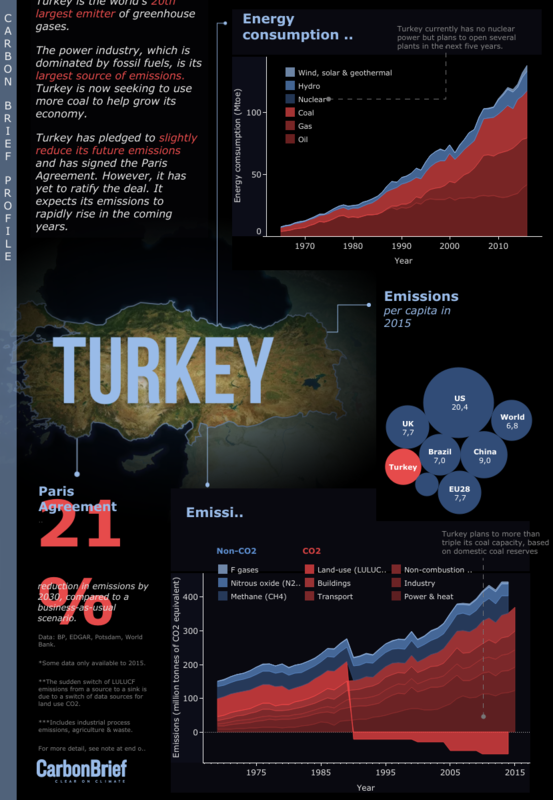 Turkey’s electricity demand is rapidly expanding and – as the infographic above shows – the power industry is the largest source of its GHG emissions. The country’s energy policy has increasingly put a large emphasis on the presumed security of supply provided by domestic coal, which it says is needed to support its economic expansion. It is currently heavily dependent on imported oil and gas, with domestic production very small. This has led to concerns over its exposure to the volatility in oil and gas prices. Turkey is particularly dependent on Russia for fossil fuel imports. Turkey currently generates 74 terawatt hours (TWh) of electricity from coal, 28% of all its electricity and well over double the 34TWh generated from coal in 2004. Around half of this comes from imports. The sources of electricity expansion over the 30 years up to 2015 are shown in the chart below. Sources of electricity production in Turkey, 1985-2015. Source: World Bank World Development Indicators for breakdown between different sources; BP Statistical Review of World Energy 2017 for total electricity generation values. Chart by Carbon Brief using Highcharts. According to CoalSwarm, Turkey currently has around 18 gigawatts (GW) of operating coal plants, making it the 13th largest fleet in the world. It intends to greatly expand this, with plans for total coal-power capacity to reach 30GW by 2023. Ören thermal power plant, Muğla, Turkey, 2013. Credit: Images & Stories / Alamy Stock Photo. Turkey currently has a further 43GW of coal-fired plants in the planning or construction phases, according to CoalSwarm. This puts it fourth after only China, India and Vietnam in its plans for coal expansion. It is worth noting, however, that only 1GW of this is currently under construction and it is unlikely all the planned coal plants will get built, in part due to protests. Water shortages could also reduce the operating efficiency and reliability of coal power plants. Most of Turkey’s large coal plants are subsidised: a 2015 report from the International Institute for Sustainable Development (IISD) estimated that coal subsidies totalled at least $730m in 2013. Turkey is thought to have around 6,000m tonnes of oil equivalent (Mtoe) of recoverable coal reserves, less than 1% of the world total. It has intensified its efforts to find new coal fields and develop existing ones in recent years. Lignite is the most commonly used type of coal in Turkey’s plants. It plans to open several new coal mines to extract domestic lignite reserves in the coming years. Coal mine on Turkey’s western Black Sea coast, 2015. Credit: Hackenberg-Photo-Cologne/Alamy Stock Photo. It is also moving to position itself in the global energy system. After three years of construction, the Trans-Anatolian Natural Gas Pipeline (TANAP) to deliver gas from Azerbaijan through Georgia and Turkey to Europe, is set to be completed in the summer of 2018. This follows another gas pipeline between Turkey and Greece, which opened in 2007. The Turkish government expects the pipeline to strengthen its role as a regional energy hub. Turkey has been singled out as having one of the largest potentials among European countries for renewables expansion, particularly for wind and geothermal power. However, as shown in the electricity production chart above, only around 6% of its electricity was produced by renewables, excluding hydro, in 2015. However, Turkey’s 2014 National Renewable Energy Action Plan had previously targeted a far larger 20GW of wind capacity by 2023. The NDC wind target has, therefore, been called a “clear and substantial reduction of ambition” on previous targets. People wait for sunset in front of a series of wind turbines, Bozcaada, Turkey, 21/08/2017. Credit: isa özdere/Alamy Stock Photo. Critics of hydropower’s dominant role in Turkey’s renewables mix point to its potential downsides, such as land flooding, loss of agricultural land and environmental injustices. Drought caused by rising global temperatures is also expected to have a negative impact on hydroelectric generation. Elsewhere, Turkey has said it plans to keep its Renewable Energy Support Mechanism(YEKDEM) and has set out plans to explore the potential for additional geothermal fields suitable for electricity generation. The IISD study found Turkey could already generate electricity more cheaply using onshore wind and solar than with coal, when externalities are included. Meanwhile, a 2014 report from WWF-Turkey and Bloomberg New Energy Finance (BNEF) concluded that expanding Turkey’s wind, solar and hydropower could meet its energy needs for the same cost as its planned coal expansion, even without including the benefits from reducing emissions and air pollution. The report also found Turkey’s energy demand may be 25% lower in 2030 than the government expects, due to expected changes in the economy and energy efficiency. The 2014 action plan also called for a 10% share of renewable energy in transport by 2023, up from less than 1% at present. While Turkey currently has no operating nuclear plants, nuclear energy is another major focus of its energy policy. Its 2015 NDC highlighted plans to commission a nuclear power plant by 2030, while more recent plans said two nuclear power plants would be operational by 2023, with a third under construction. 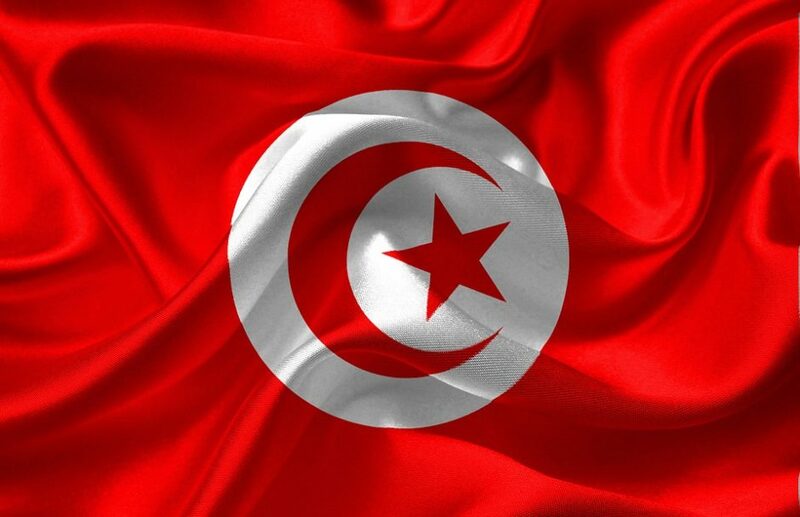 The first of these, the 4.8GW Akkuyu nuclear plant set to be built on the Mediterranean coast, was initially expected to be fully operational by 2019. However, it has been beset by delays and may now even miss its new 2023 target. Russia’s President Vladimir Putin (R) and Turkey’s President Recep Tayyip Erdogan shake hands during a videoconference to launch the construction of the first reactor of the Akkuyu nuclear power station, 3 April 2017. Credit: ITAR-TASS News Agency/Alamy Live News. Rosatom, the Russian developer, was granted a construction licence to start work on the plant earlier this month, but is reportedly struggling to find local partners to share costs. Earlier this month, construction reportedly started on the first of four 1.2GW units. Meanwhile, costs have been rising on the second project, the 4.5GW Sinop nuclear power plant led by Japan and being built by the Black Sea. The third site is supposed to be built in the northwestern Kırklareli province. While Turkey institutionalised climate change in public policy fairly early, the ambition of its goals remains low. In 2005, it enacted the Renewable Energy Law, with a target to source 30% of its electricity from renewables, including hydro, by 2023. However, Turkey already achieved this target in 2015, as the electricity consumption chart above shows. The law set up a renewables feed-in tariff and requires energy retailers to buy a set amount of their total uptake from licensed renewable energy generators. It also requires grid operators to give access to renewable generators. A later 2007 act set a target to increase geothermal energy production and consumption 10-fold, while the 2013 electricity market law introduced new tax deductions for renewables up 2030. In 2010, Turkey published its Climate Change Strategy up to 2020. This outlines Turkey’s vision to address climate change and its ambition to “transition to low carbon economy”. It set out policies to reduce emissions from energy, industry, transportation, waste and land-use change. It repeated the 30% renewable electricity target for 2023 and aimed to cut GHG emissions from electricity 7% by 2030. The Climate Change Action Plan, published the next year in 2011, set out short-, mid- and long-term plans to tackle climate change. It set a target to increase the amount of sequestered carbon in agricultural forestry activities by 10% by 2020, compared to 2007. Turkey’s 2018 energy efficiency action plan aims to cut primary energy consumption by 24Mtoe by 2023. This cut is likely to be relative to BAU, though it does not say so explicitly. The strategy commits $11bn towards energy savings across several sectors, including buildings, transport, energy and agriculture. Turkey had also passed energy efficiency laws in 2007 and 2012. On the other hand, the government is also preparing a law to provide exemptions from environmental regulations for new coal-fired power plants. A similar initiative was previously rejected by the constitutional court, according to a 2016 report from the IASS. The report points out that a rhetoric focussed on fossil fuels among the political elite and the absence of long-term planning also reduce the attractiveness of the sustainable energy sector for investors. Turkey considers market-based instruments to be a key part of its climate policy. Its NDC states that it “aims to use carbon credits from international market mechanisms to achieve its 2030 mitigation target”. However, some analysts have warned that use of carbon markets could risk Turkey exporting some of its emissions to other developing countries. Turkey has so far operated only in voluntary carbon markets, in which 1.9MtCO2e of offsets were transacted for a total $2m in 2017, the sixth largest of all countries. This is equivalent to less than half of 1% of Turkey’s annual emissions. However, Turkey adopted a new regulatory framework for a mandatory emissions reporting system in 2012. This is set to pave the way for a formal emissions trading system (ETS). Monitoring started in 2015 and Turkey last year completed the first year of mandatory emissions reporting. Turkey’s candidature to the EU also means it would need to comply with the rules of the EU ETS, with emissions reporting legislation an important step towards this. Turkey is located at the eastern end of the Mediterranean basin, which is expected to be significantly hit by drought due to human-caused climate change. Agriculture and food production will be strongly affected, a recent study found, with irrigated production at particular risk of decline as water stress increases. A Vineyard near Teos, Turkey with grapes that have shrivelled up in the drought like conditions, 2009. Credit: Global Warming Images/Alamy Stock Photo. Even if global temperatures are limited to 2C, the area is expected to be strongly affected by warming and, in particular, face extreme temperatures in summer. Warming is expected to lead to increasing desertification and to impact on human health both directly and indirectly, such as through food and water supplies. Turkey’s fifth national communication to the UNFCCC outlines its vulnerability to increasing levels of water stress, forest fires and the health effects of climate change, such as those due to heat waves and vector-borne diseases. It also notes Turkey’s vulnerability to sea level rise, with a population density along its coastlines that is double the rest of the country. A 2013 OECD analysis documented increasing summer temperatures, falling winter precipitation in the western provinces and 12cm of sea level rise over the past century for the Mediterranean and Black Sea regions. A further 2016 study found an expansion of dry areas in the central and south-west regions, but increased rainfall in the north-east between 1981 and 2010. Adaptation is mentioned only briefly in Turkey’s NDC and it has yet to submit a National Adaptation Plan to the UNFCCC. However, it did pass a 2005 act to promote adaptation and protection of soil quality in areas at risk of degradation due to climate change. Its 2010 strategy and 2011 action plan on climate change also developed policies on climate change adaptation, particularly with regards to water resource management. Data for energy consumption comes from BP Statistical Review of World Energy 2017. Greenhouse gas emissions per capita in 2015 come from combining emissions data, including LULUCF, compiled by the Potsdam Institute for Climate Impact Research (PIK) and population data from the World Bank. The PIK database also shows Turkey has the world’s 20th largest greenhouse gas emissions (inc LULUCF). Turkey’s pledge to reduce emissions by 37% by 2025 compared to 2005 levels comes from its NDC submitted to the UN in 2015. The graph showing emissions by sector comes from combining two datasets. Values for methane (CH4), nitrous oxide (N2O) and fluorinated gases cover all sectors, including LULUCF, and come from the PIK database. Values for CO2 from LULUCF also come from the PIK database.